The sorry saga of the jacket I chose as the centre piece of my Sewing with a Plan (SWAP) challenge meant I was determined to fix on an alternative before the New Year. So for the last few days I have been plotting. I wanted a jacket that has a shape that contrasts with this one, Simplicity 7305. Initially I scoured the pattern sites, and looked at lots of vintage patterns (gussets have died a death in both RTW and modern commercial patterns). Because I could not find what I had in mind I designed my own pattern for this project. 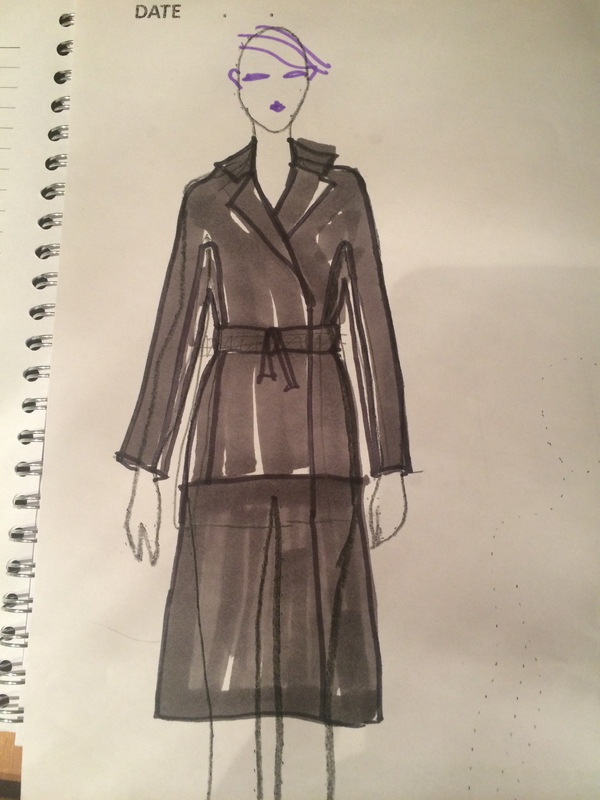 So I have made a pattern for a simple jacket pattern without side seams, but with a gusset panel at the side body, and kimono sleeves. There is a back piece cut on the fold, jacket fronts, a facing, a two piece collar, and a belt. And a lining pattern. I am toiling it in a nice wool (welcome back into my life wool, my old friend) that is actually a dark navy with little bits of green in it, although you can’t see it here. 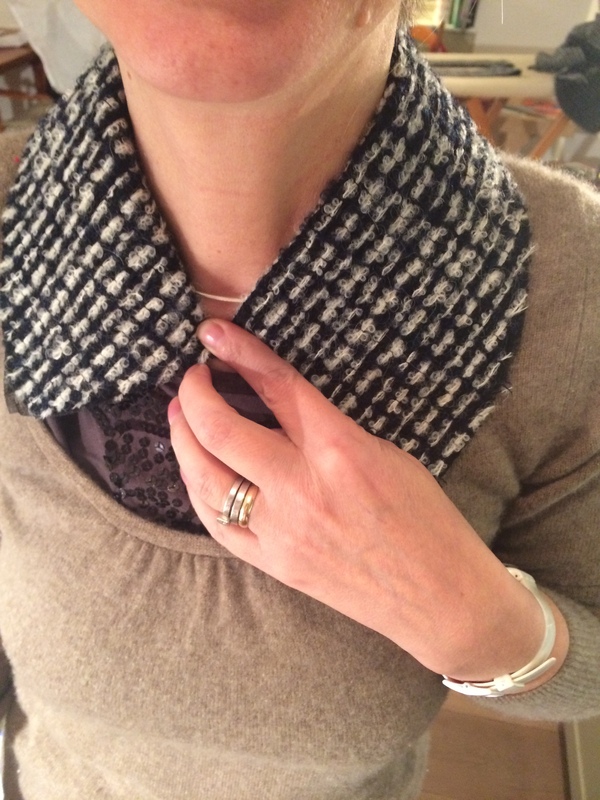 This is me checking the style and size of the collar (obviously it will be somewhat smaller when sewn). A short sleeve jacket is a novel look but I think it will look quite nice with a jumper underneath, especially to lighten it up as this is quite a dark fabric for me. Here it is, partly sewn, with shoulder seams pinned and collar draped. I will want to make sure the stand actually stands by pad stitching some firm organdie to it and gives some height to the collar. I think this can be achieved with pad stitching. I tied it up with my purple silk belt. When I make up this jacket for the SWAP I shall make it with full length sleeves, but that will probably require a change to the gusset. I would ideally want the sleeves to be fairly slim, so I will taper the gusset, or maybe ending it with a triangle fairly close to the underarm. Also with a longer sleeve it is possible that I may need to deepen the angle. In the fairly thick wool (below) the sleeves have a life of their own. 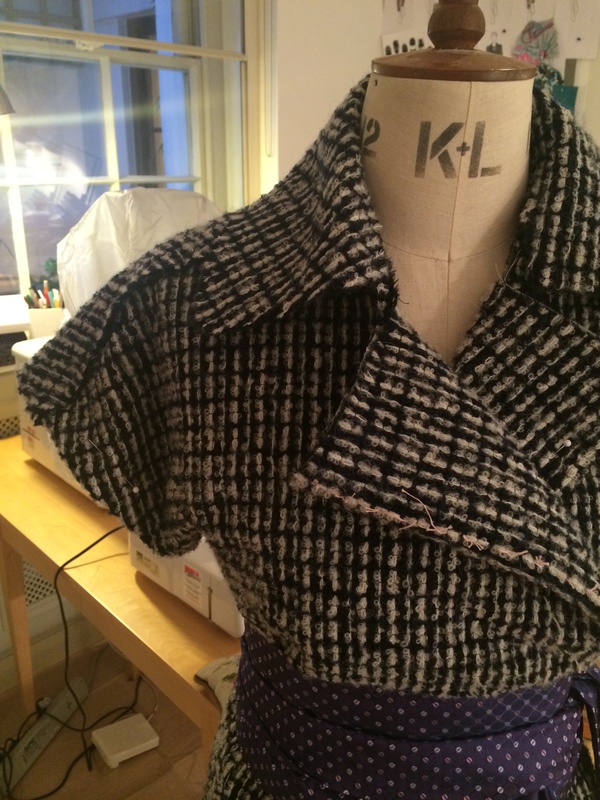 If the sleeves work well, I will have a pattern that could also work very well as a coat. Also I think this might work well with some exposed seams, say on the shoulder. Or with the side panel in a contrasting fabric. 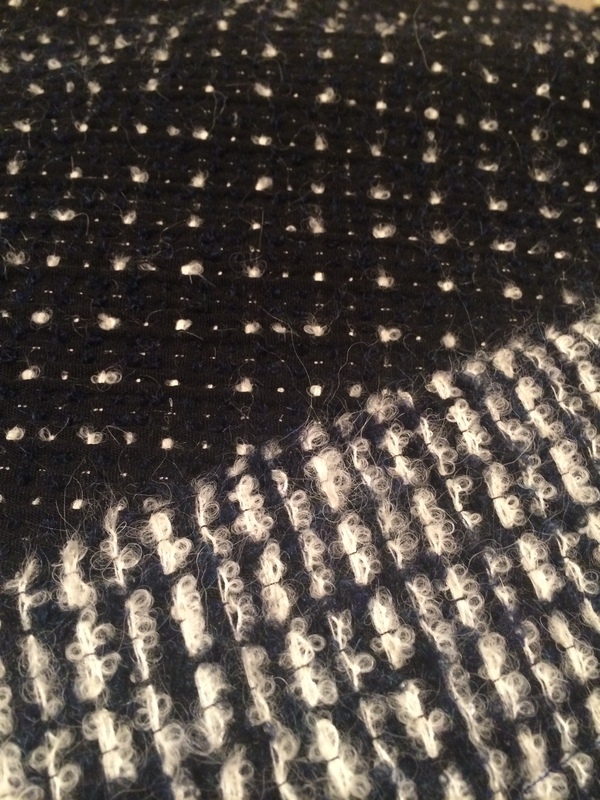 This wool is very nice as it has an interesting reverse. In making up the toile I created two belts – one with the check, and one (that I am wearing at the top of the post) with the reverse spotty side. I went with a narrower belt due to the shortage of fabric. This is joined in three places. I am pleased to say that I love this pattern, and it got the thumbs up from my family members. 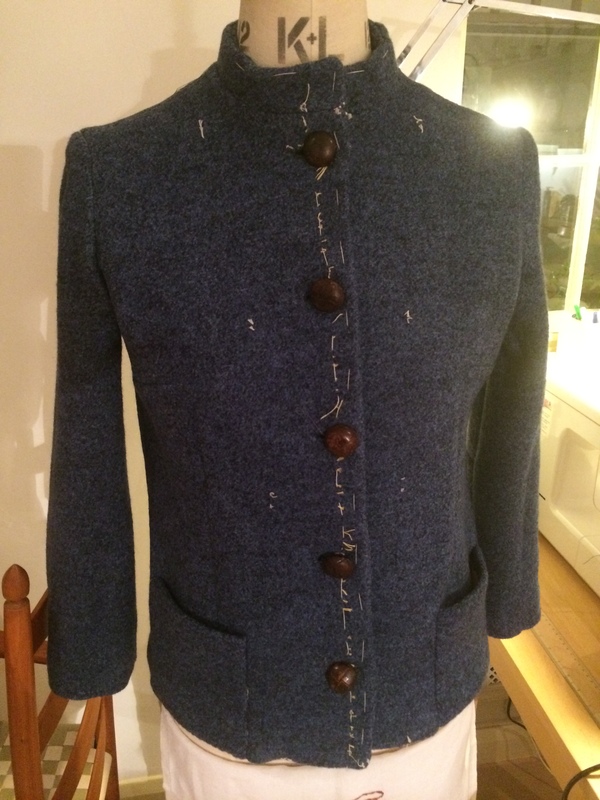 As far as the SWAP is concerned this jacket will now replace the Simplicity 100. I made up the 1970s wrap round skirt too – it makes a nice suit with an A line skirt, but I don’t think I will do this skirt for the SWAP. Amazing. That is as right for you as the other was wrong (if you know what I mean). The large collar and the fullness of the kimono style gives you a nice top line and the short sleeves look really good. I love it! It’s a great style for you and I like the short sleeves. It makes it different and unique. Hi – I just recently cane across your blog and am really enjoying reading it. 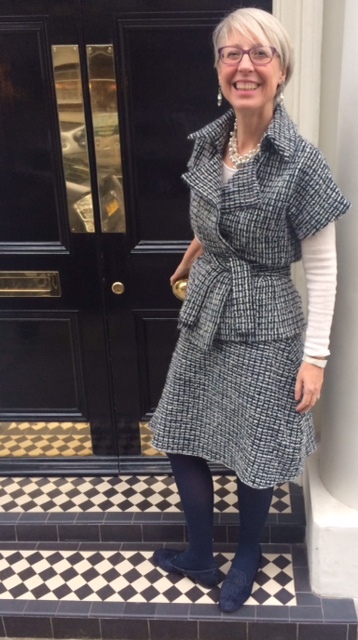 I love this type of short sleeve jacket – and with the skirt it’s a less formal option to a regular suit. That is really lovely, quirky,stylish. You look as if you are enjoying wearing it. I adore this on you. I didn’t see much wrong with the other one, but now I see this is much more your personality…lively and interesting. really cool. Your a trooper… keep marching forward —- so exciting. OK Kate…now you are smiling and this outfit is YOU. Love the fabric and collar and lapels. I second Galina’s comment! Nice evolution and the collar is terrific.